With Harrison Barnes returning to school, UNC has a legitimate shot to be the preseason number one next year (depending on how many of Kentucky’s players return next year). Knox gave Roy Williams valuable minutes this year, but James McAdoo will definitely be a step up talent-wise at the power forward position (he and Hairston are McDonalds’ All-Americans). Once again, UNC will be very deep everywhere except the point guard position. That should not matter though assuming Kendall Marshall keeps improving. **I want to put some theories to rest about this game: (1) Duke shouldn’t have played Kyrie Irving. That is the dumbest thing I have ever heard. Irving was Duke’s best player by a country mile. Were there chemistry problems moving Nolan Smith back off the ball to his natural position? Absolutely. Did those chemistry problems cause Duke to perform worse than without Irving against Michigan or Arizona? Not at all. Against Michigan, Duke had a healthy lead in the second half before going into what Bill Simmons calls the “clogged toilet offense” too early. The Blue Devils stopped being aggressive and had some hideous offensive possessions that really let the Wolverines back in it. As for Arizona, they would have beaten any team in the country if they played the way they did against Duke. Yes, Duke had suspect foot speed (a point Jeff Goodman made after the game), but Saint John’s was the only team all season able to take advantage of it. Arizona just played out of its mind. Derrick Williams had a truly phenomenal first half performance to keep them in the game (seriously, if he had only had the six points he had against UConn, they would have been down 25 at the half), and then they blitzed Duke in the second half with an athletic dribble-drive attack that found the holes behind Duke’s aggressive man defense. Arizona was very successful at turning long rebounds into fast breaks (and highlight dunks), which sparked their 19-2 run that gave them a seven-point lead in the second half. The Wildcats also made every open three Duke gave them. By the under-eight timeout, Duke looked beat, even though the game was still in reach. I am not sure why Mike Krzyzewski did not call a timeout somewhere in Arizona’s big run, but at that point, the crowd and momentum had totally reversed the game, and Duke could not buy a stop. So I do not want to hear about Irving losing that game for Duke: he scored 28 points efficiently. Nolan Smith had been slumping most of March even before Irving came back into the lineup, probably because he was forced to carry the team for the entire season. If Kryzyewski hadn’t played Irving, the game would have only been uglier. Duke has a terrific class coming in next year. Rivers, Plumlee and Cook are all McDonald’s All-Americans. Gbinije will help make up for losing Singler on the wing (with Hairston’s help), and Cook will probably split the point guard spot with Tyler Thornton, though by the end of the season, I expect Cook to be seeing most of the minutes. Cook is a very good facilitator, which will be crucial for taking advantage of the offensive weapons on the Duke. Rivers will definitely be an instant impact player though he is probably another one and done. Basically, even though Duke is losing three very talented players, it will still be a top ten team, and maybe top five by the end of the season. **If you can’t tell, I am marking somewhat related, but long digressions with the asterisks. Here I want to draw your attention to Butler’s game earlier in the season against Florida State. The Bulldogs shot an abysmal 38% from the floor, which I attribute almost totally to the Seminoles’ defense. But Butler still won (largely thanks to Shelvin Mack and Matt Howard’s solid play). Florida State only had three blocks. Anyone who thinks that UConn’s defense is solely responsible for Butler’s horrific 18.8% shooting in the championship game is over-simplifying things. UConn is very good at forcing opponents to take tough twos and threes, like Florida State. It also had more length and athleticism than Butler. However, Florida State had more length and athleticism than UConn (just with a nonexistent offense and without Kemba Walker). If Butler had been held to 38%, I would credit the Husky defense, but less than 20% is a statistical outlier. Butler just couldn’t get shots to go down, and neither Matt Howard nor Shelvin Mack were able to take the game over. I am in no way saying Connecticut did not deserve to win, but giving all the credit to its defense is not fair, either. I think Florida State is going to struggle next year to replace Derwin Kitchen and Chris Singleton. The way the Seminoles played without Singleton bodes well on that front, but they will need someone to take over and run the offense. Whisnant will give them a sharpshooter, Thomas a penetrator, and Space a little bit of everything else. Personally, I think Space will really excel in Hamilton’s system, but I still think the Seminoles will take a small step back as they try to integrate the new players. I think Clemson has another very good shot to get back to the NCAA Tournament next season. Assuming Devin Booker continues to develop into more of an offensive threat and Andre Young can run the offense, I think they have a strong case to finish in the top half of the ACC. One key player to keep an eye on is Milton Jennings. Jennings was fairly unspectacular this season, but he is a terrific rebounder. If he can get a little more offensive polish, things are looking very good for Clemson moving forward. Boston College is in for a rebuilding year next year especially if Reggie Jackson stays in the draft. Steve Donahue loses pretty much everyone. Moton and Rubin gave him valuable minutes as freshmen, but both have a long way to go. Rubin needs to add more to his offensive game besides the three, and Moton should probably take less threes. The Eagles have a very deep incoming class, but I am not sure it is “instant impact” material. With Jackson, I think this team could finish somewhere just below the middle of the conference, but without him I think it will finish close to the bottom. I think things are really starting to look up for Virginia. As Tony Bennett gets his feet under him, he is starting to pull in some very good recruits (both Brogdon and Jesperson are ranked in the ESPNU100). Especially with Scott back, I think this team can make some noise. I am hesitant to put them back in the top half of the conference without seeing them play, but I think the Cavaliers will absorb losing Farrakhan and have a better season next year. I think Maryland’s fate hinges on Jordan Williams’ decision. If he stays, the Terps should be very much in the running for that third place spot in the conference (assuming Duke and North Carolina do not collapse), if not the favorites for it. Nick Faust is the most interesting of Gary Williams’ incoming recruits, as he is a 6’6″ athletic wing that can score. He will definitely see plenty of playing time in my opinion. Stoglin and Howard showed flashes of brilliance (Stoglin especially) in their freshman campaigns. The guy I think will be the X-factor is Sean Mosely, whom everyone thought would have a much better season this year. If Mosely can provide a legitimate scoring option on the perimeter with Stoglin to spread the floor for Williams, this is a very solid team. Incoming: Dorian Finney-Smith, Robert Brown, CJ Barksdale, and Marquis Rankin. Virginia Tech loses a whole lot this year, but it sports probably the second or third best recruiting class in the ACC (depending on how highly you rank depth). Finney-Smith is a highly-regarded small forward with a nose for the ball, Brown is a solid two guard, and Barksdale is a promising power forward although he will probably take some time to develop). Erick Green is going to be the key for this team though, as he played a critical role moving Delaney off the ball. I think the Hokies have a chance to get to the NCAA Tournament next year, but this year was definitely a missed opportunity. The big question for Miami is how they handle the transition to Jim Larranaga and perhaps more importantly missing out on the chance to land Frank Martin. Still Larranaga has the ability and pedigree to turn this into a respectable program even if nobody will burden him with the expectations they would have had if Martin was in Coral Gables. If Reggie Johnson comes to his senses and returns, he will have to play more minutes (read: avoid foul trouble) because without Thomas, Miami will be much smaller. With Johnson having the potential to be a dominant big man in the ACC and Scott and Grant providing perimeter scoring Miami is definitely one of the more interesting teams to watch going forward. Paul Hewitt had to go, but that does not mean Georgia Tech upgraded significantly with Brian Gregory. The reason I think Hewitt had to leave is because the fan base expected him to. If the university had stuck by Hewitt, it would have alienated an often volatile fan base (probably with major attendance implications). Unfortunately, there was not a ton of money left over to get a big name coach, so the Yellow Jackets settled on Dayton’s Brian Gregory. Gregory is a good coach (a former assistant of Tom Izzo), but his style is not pretty. Dayton fans seemed happy to see him go (though fans are not impartial), but I think Gregory’s “best case” scenario mirrors Herb Sendek. Though he does not run the Princeton offense, Gregory’s teams at Dayton struggled offensively. The key to his success (and any coach at Georgia Tech for that matter) is whether he can recruit local talent. Georgia is a hotbed for basketball talent, and if Gregory can keep most of that talent in Atlanta, Georgia Tech will be successful. That success may top out around the Sweet 16, but that would be a big step up from where Hewitt has taken them. Like Paul Hewitt, Sidney Lowe had to go. It was a painful dismissal for Wolfpack nation, as Lowe is (and should be) a beloved member of the community. Then came the fiasco that masqueraded as the NC State coaching search. While Debbie Yow, NC State’s athletic director, did not openly fly around the country to get turned down by high profile candidates like Mike Alden at Missouri, it felt like State was rejected often. Most notably, Memphis’ Josh Pastner, VCU’s Shaka Smart, and Wichita State’s Gregg Marshall spurned the Wolfpack in spite of generous ($2M+ a year) offers from Raleigh. NC State finally settled on Mark Gottfried, who was formerly the coach of Alabama. Unfortunately, the hire was sort of overshadowed in the NC State’s press conference by Yow accusing Gary Williams (she was formerly the AD at Maryland, and notoriously did not get along with Williams) of “trying to sabotage” the coaching search. Williams has denied the rumors, but it definitely took away from the hiring of Gottfried. My guess is that Gottfried would just like some time to get to know his team and start rebuilding the program. Gottfried had a good deal of success with the Crimson Tide but became distanced with the fan base during his last couple of seasons. 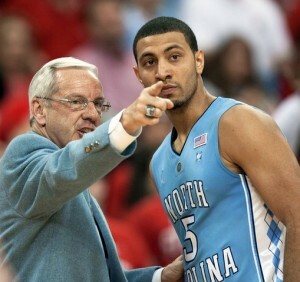 There is also the unspoken story behind both Gottfried’s and his star player’s departure in 2009 (Ronald Steele). Steele had come back from major knee surgeries, but only played less than a month before decided to leave the team in late January. Gottfried did not last much longer. Despite lots of internet research, I couldn’t find anything concrete on what happened. I suggest checking out Thee Sports Blog’s interview with the Alabama Basketball Blog for an interesting take on the hire. Harrow has already decided to leave NC State, but with Brown and Leslie Gottfried has a fairly good team to work with next season. I think the year after next is a better shot to make the Big Dance, as that class will be juniors and he will have a solid class of his own to add to the mix. One interesting thing from the interview is that Gottfried likes to run his offense out of the high post (something Tracy Smith would have been very good at doing), so he might be a year late. The good news about Wake’s future is they were the 327th most experienced team season with an average experience of one year according to Ken Pomeroy. This is a very young team. Other than Gary Clark, the team is almost exclusively freshmen and sophomores. I think Jeff Bzdelik will have a chance to develop last year’s freshmen class until they graduate, but he definitely needs to show marked improvement over last year, which should not be hard. If you are looking for a team that will improve dramatically, I would not look much further than Miami and Wake Forest. I think both of these teams underperformed last year, and a year of experience will win them a lot more games (“a lot” is still very relative for Wake, but they should have a much more respectable tally by the end of next year). 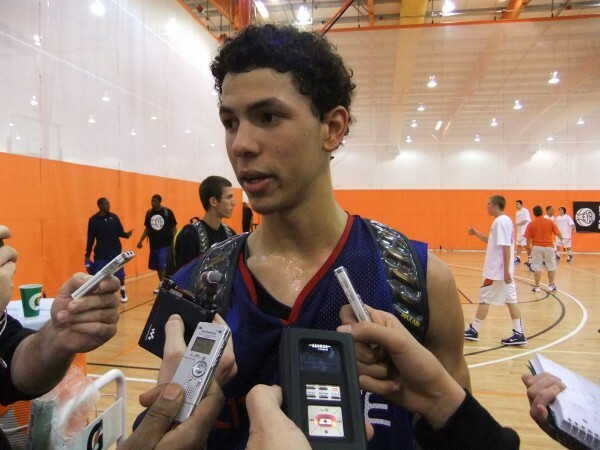 Austin Rivers, who leads an impressive freshman class at Duke, should be used to the spotlight when he arrives in Durham. The ACC will not have many dramatic changes next year. North Carolina and Duke will be leaps and bounds above the rest of the conference talent-wise (though Duke may be young enough to be dealt some upsets), but I think the conference as a whole should improve on this year’s four bids to the NCAA Tournament. I think Miami will be rising substantially, Florida State will probably fall the most though a tough defense will keep them in the top half. Virginia Tech is a little bit of a wildcard, but their talented recruiting class should at least have them in the conversation for a NCAA bid. Truthfully, much of the conference’s success comes down to the success of its new coaches: Brad Brownell, Jeff Bzdelik, Steve Donahue, Mark Gottfried, Brian Gregory, and Jim Larranaga as all of them have less than two years of experience in the conference. It should also be noted that the conference has gone from a plurality of minority coaches to just Leonard Hamilton (Skinner, Hewitt, Purnell, Lowe. and Haith all left). I think that recent trend is nothing to be alarmed at, but I hope we see some movement back the other way as jobs keep changing. It should be a fun season once again, as the bottom of the conference moves up (I expect improvements out of all of the bottom tier) to challenge the middle. Once again, the ACC may not have great third team, but I think the conference will be one of the best from top to bottom next season. This entry was posted on Thursday, April 28th, 2011 at 8:05 am by Brian Goodman	and is filed under conference report cards. Tagged: aaron thomas, adrian bowie, adrian thomas, andre dawkins, andre young, andrew rutledge, anthony fields, antwan space, ari stewart, assane sene, austin rivers, Bernard James, bernard sullivan, biko paris, bishop daniels, bobby sparks, boston college, brad brownell, brian gregory, brian oliver, carson desrosier, chase fischer, chris singleton, CJ Barksdale, cj harris, cj williams, clemson, cliff tucker, corey raji, cortney dunn, daniel bolick, daniel green, daniel miller, daniel sapp, danny rubin, darion atkins, deividas dulkys, demontez stitt, dennis clifford, derwin kitchen, desmond hubert, devin booker, devin coleman, dexter strickland, dino gregory, dorenzo hudson, dorian finney-smith, duke, durand scott, eddie odio, erick green, florida state, frank haith, gabriel moton, garrius adams, gary clark, georgia tech, Glen Rice, iman shumpert, james mcadoo, jason morris, javier gonzalez, jeff allen, jeff bzdelik, jerai grant, jim larranaga, Joe harris, joe trapani, john cahill, john henson, jontel evans, jordan daniels, josh hairston, josh southern, jt terrell, julian gamble, julian royal, justin knox, justin watts, kendall marshall, kj mcdaniels, KT HArrell, kyle caudill, kyle singler, lance storrs, larry drew II, leonard hamilton, leslie mcdonald, lonnie jackson, malcolm brogdon, malcolm delaney, mark gottfried, Marquis Rankin, marshall plumlee, martin breunig, maryland, mason plumlee, maurice miller, mfon udofia, miami, Michael Gbinje, michael snaer, mike krzyzewski, miles plumlee, milton jennings, Mustapha Farrakhan, nc state, nick faust, nolan smith, north carolina, okaru white, paul hewitt, paul jesperson, pe'shon howard, pj hairston, quinn cook, reggie bullock, reggie jackson, reggie johnson, richard howell, rion brown, robert brown, roy williams, ryan anderson, ryan harrow, ryan kelly, sammy zeglinski, Scott Wood, sean mosely, seth curry, sidney lowe, sterling gibbs, steve donahue, tanner smith, terrell stoglin, terry whisnant, tony bennett, tracy smith, travis mckie, ty waller, tyler thornton, tyler zeller, van hatchell, victor davila, virginia, virginia tech, wake forest, will sherrill, zavier anderson. You can follow any responses to this entry through the RSS 2.0 feed. You can leave a response, or trackback from your own site. Nice job, Matt. Very informative. I can’t give Duke an A. The defending national champions have to do better than the Sweet 16 to earn a good grade, in my estimation. I really like Brownell at Clemson in the years to come. He’ll do a lot of good there and has already started given this year’s success. On the contrary, I think Brian Gregory is a terrible hire for Georgia Tech. This guy has been a career underachiever and while he has the Izzo pedigree, he’s not a very good coach in my opinion. Hewitt was awful too (I’ve always been a Hewitt “hater”) but Gregory is not much better. I love smart, defensive oriented coaches like Tony Bennett so I agree with you on UVA. The Cavs have a nice future ahead of them with Bennett at the helm. Miami could make some noise but that’s the worst job in the conference and the program has zero buzz about it, never has really. Larranaga is a good coach but I’m not sure he can change the culture of mediocrity and apathy that quickly, if at all. I think Gottfried will surprise at NC State. I thought he did a nice job at Alabama over the years. NC State is a really tough job but I think he can have some success there. We’re going to be lousy again. Anything else would require a miraculous off season. Half the fan base wants Bzdelik fired yesterday. Not good for a first year coach, but when you’re 58 years old, have no track record of success, and make a bad situation worse that seems about right. As a Duke alum (’80), it was painful to see them lose to Zona and then see Zona become human again against UCONN. But your analysis is correct: no one could have beat Zona that night; not when you go 9 for 15 from three, and score 55 points in the second half. Duke fans are left with the cruel “what if ” about Kyrie: he never even got to suit up in a game against North Carolina! Your analysis is also correct that Singler had a sub-par season and probably cost himself millions by coming back for his senior year.Tough to face it, but his shooting was not up to expectations. The team will be young next year with just one senior ( Miles) so a second place finnish behind UNC-ch is realistic. Carolina is indeed the top team in the country, but their last regular season game is in Cameron–where anything can happen ! Well, certainly Zona was red hot in the second half against Duke, and then cooled off against UConn, but at least part of the credit/blame should go to the Wildcats’ opponents. Duke was awful in the second half against Zona (their effort on the glass was abysmal, they were getting beat up and down the court in transition and they were getting flustered easily – Nolan Smith in particular). UConn, on the other hand, pounded the glass, got back in transition, clogged the lane and, most importantly, got Derrick Williams in foul trouble early. Yes, Arizona would have beaten many teams in the country with the way they played in that Sweet 16 second half, but a championship caliber team – like UConn was, and like Duke was not – would not have let that happen. Zona had a couple runs in the second half in the regional final, but UConn turned off the water when they needed to. Duke was unable to do that.